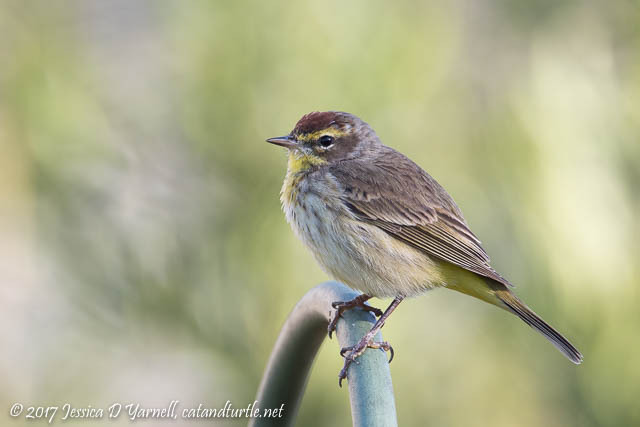 Recent posts have highlighted my backyard birding attempts to make “good” images of my feathered friends. 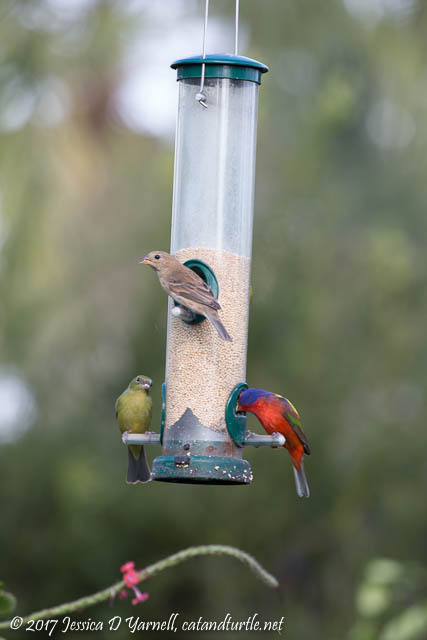 Today I share with you the behind-the-scenes shots – the feeders! Most of the time I try to keep the human elements out of my pictures. But seeing the birds hanging out is such fun, and reveals a lot about bird behavior. 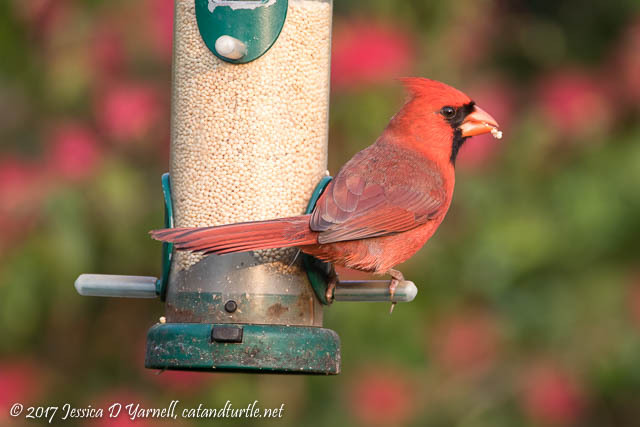 So come enjoy some backyard bird feeder fun! 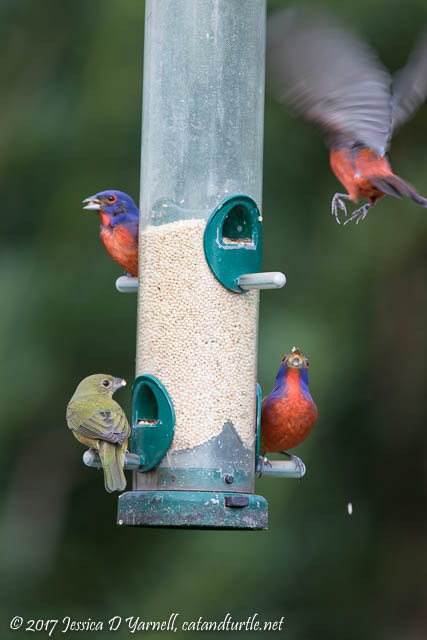 How often do you get to see three male Painted Buntings at a feeder? It’s pretty cool! (Four is better.) It’s even more fun to watch them squabble as they fly in and out. Look at the expression of the guy on the bottom right! 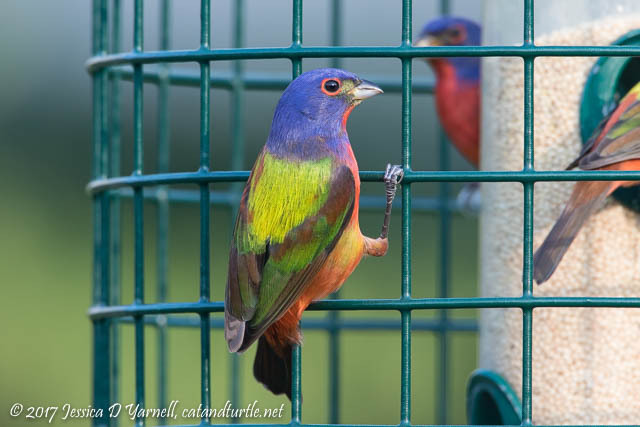 Note that I usually cover my Painted Bunting feeder with a cage designed to keep the big birds out. 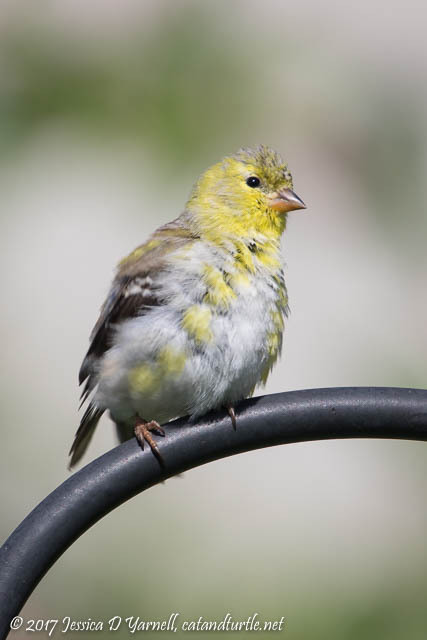 The little birds have no trouble getting through the holes in the wire mesh (even some of the bigger birds get through, like female Red-winged Blackbirds). The cage helps me make sure the more expensive millet gets eaten by the little birds who appreciate it, not the the doves or the blackbird piggies who will eat anything you put in front of them! Yep, like those Red-winged Blackbirds! They take over the feeders and force the buntings to take cover in the bushes. Except for this one intrepid male who wasn’t going to let them get between him and his millet! The males are beautiful but I enjoy watching the “greenies” just as much. 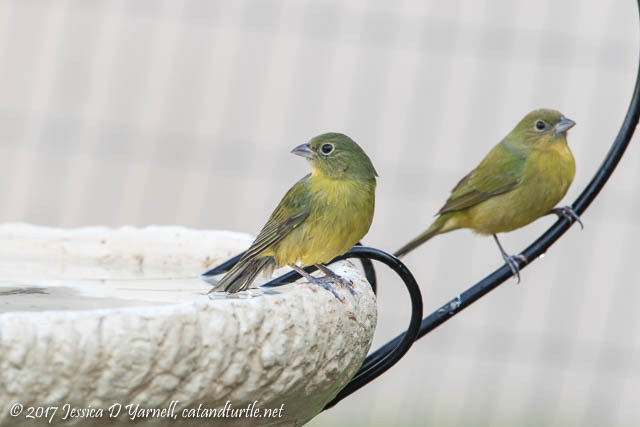 The “greenies” are the female and juvenile buntings. 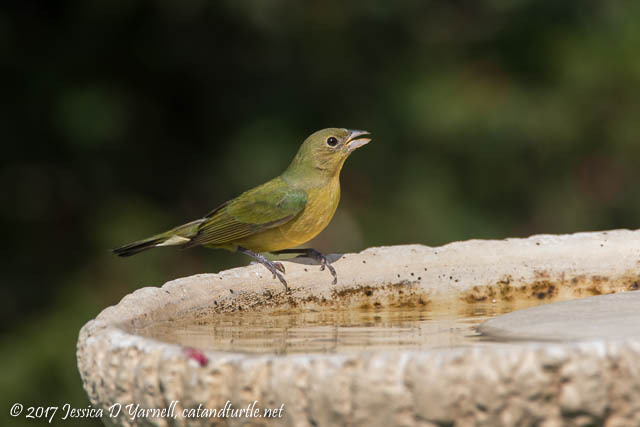 They love to come to the birdbath in the afternoon. I’ve made a point of refilling the birdbath almost every day this spring. Plus they enjoy the dripper. At one point we had three greenies and one male all splashing around at the same time! The buntings aren’t the only ones who like the millet. 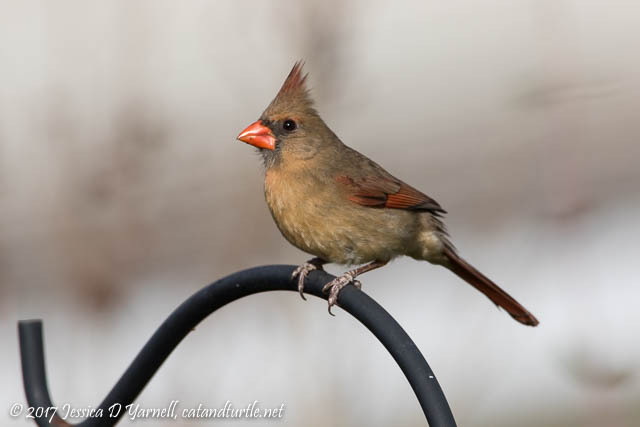 The cardinals were very happy to find the feeder uncovered. 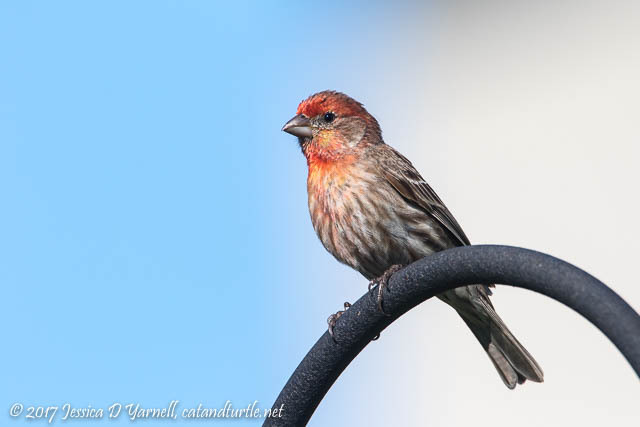 Too bad a male bunting didn’t fly in at the same time – it’s fun to see the bright reds together! The cardinals aren’t picky. 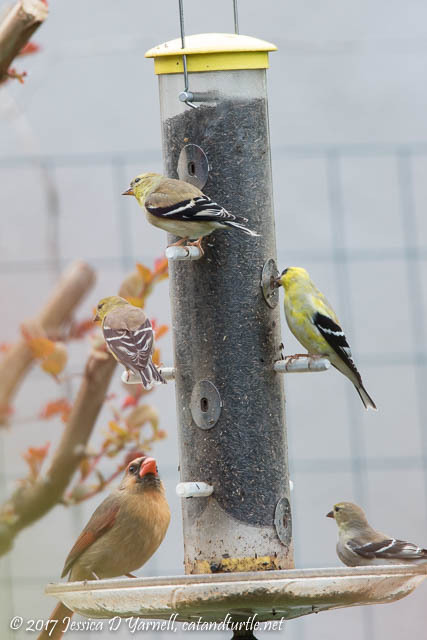 I had to laugh when I saw the flurry of activity around the goldfinch feeder, as about a dozen goldfinches vied for the 6 ports, and then most of them scattered when a cardinal flew in to try some niger. 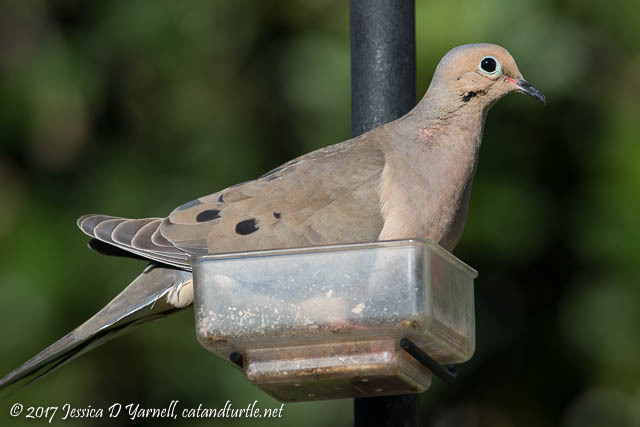 The doves also like to pick at the niger left on the bottom tray. I keep a bottom tray on some of my feeders to allow the bigger birds to perch more comfortably, and also to keep the mess a little more contained. 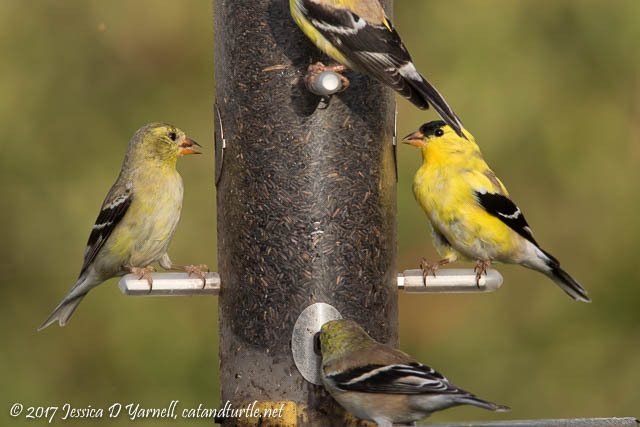 Dozens of goldfinches can throw a lot of seed on the ground! 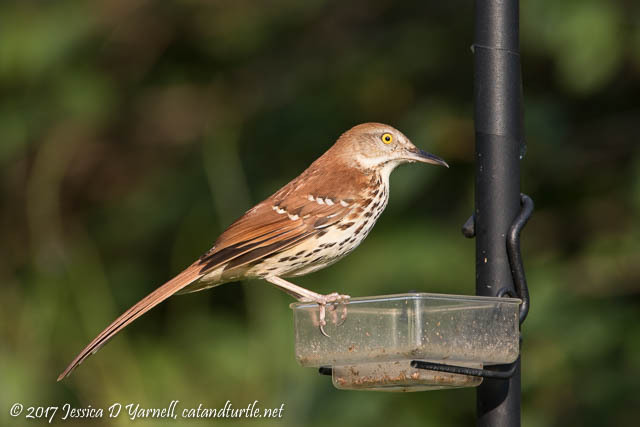 Another bird who doesn’t worry about making a mess is the Brown Thrasher. I can always tell when they are back in the spring because they throw the mulch out of my flowerbeds as they search for food. Here the thrasher is enjoying a well-earned mealworm from the feeder. I found a long time ago that it’s good to separate the mealworm feeder from the rest of the feeders, or it’s too easy for the piggies to go nuts on the mealworms! 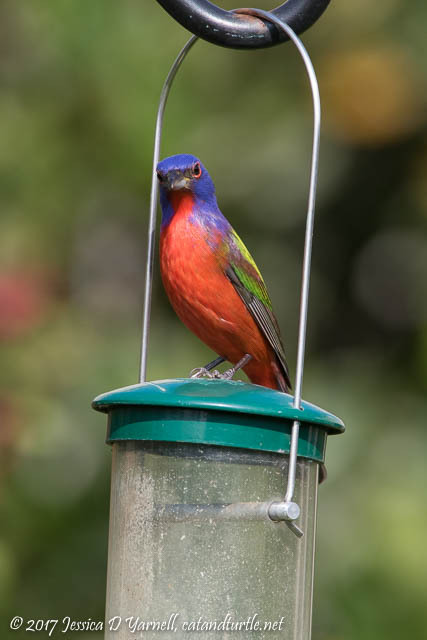 This male Painted Bunting knows how to land on feeders. He also knew how to hop right to his feeder and dig in! 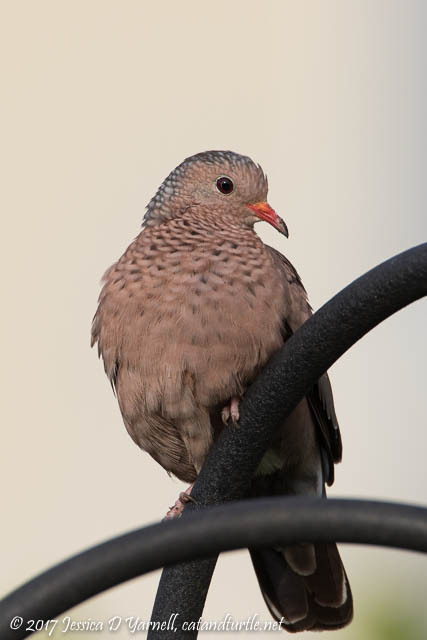 We have at least three Common Ground Doves who quietly fly in and enjoy our feeders. They look extra-spiffy in their spring breeding colors. Look at that bright orange beak and pale blue on the back of his head! I think his mate is already on a nest. I can’t wait to welcome their babies to the feeders. 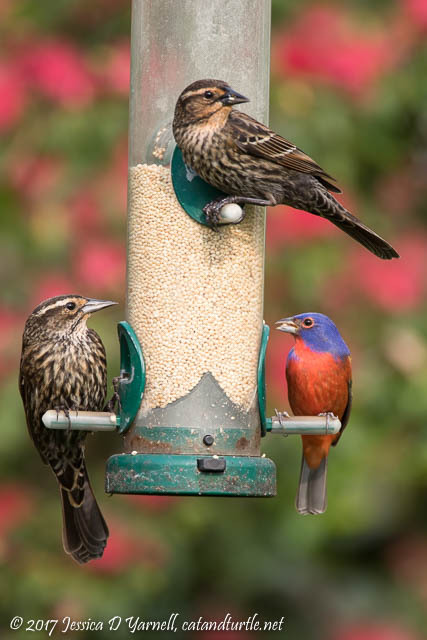 My feeder crooks are very popular with the birds. Don’t you think? 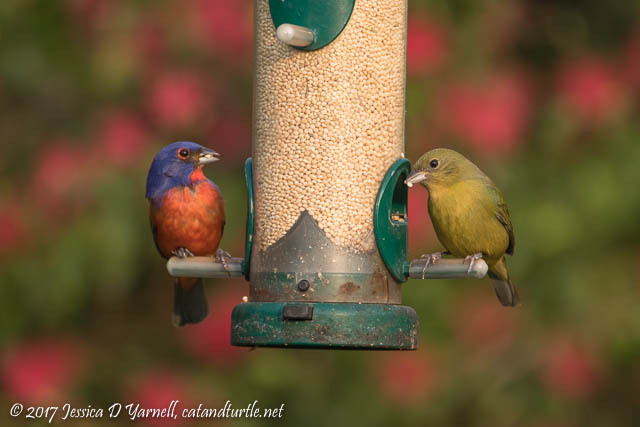 You haven’t forgotten the Indigo Bunting that visited a few weeks ago, have you? 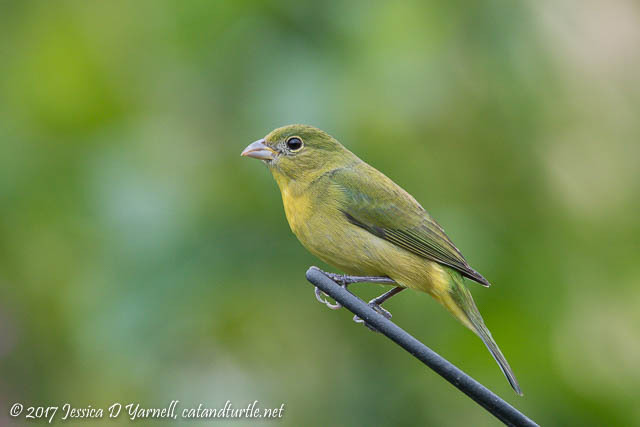 I enjoyed seeing her visit the feeders along with the Painted Buntings. Red, green, and brown – all that is missing is blue! 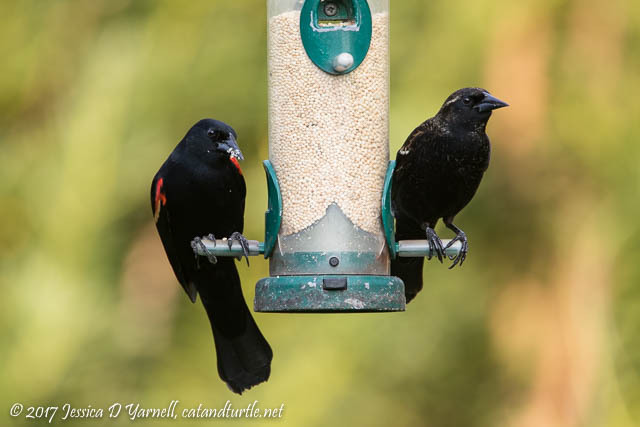 The Red-winged Blackbirds are going through some springtime color changes, too. The males are flashing those giant red patches on their wings. They are very pretty, especially when they throw their heads back and sing. 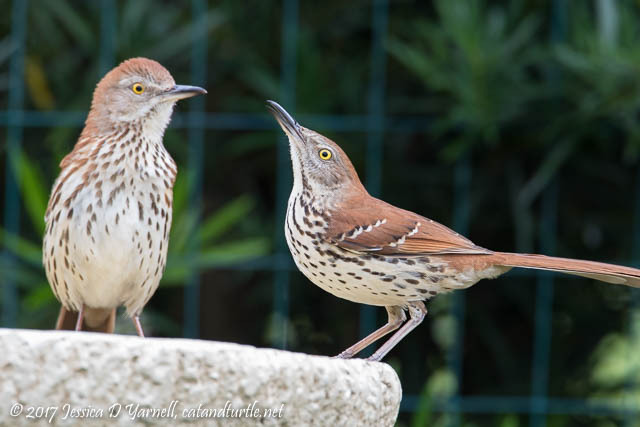 Juvenile birds are also getting into their male colors. They still show traces of their juvenile stripes, along with fresh brilliant black feathers. …and here is one of his counterparts as she fluffs her wing after a bath! 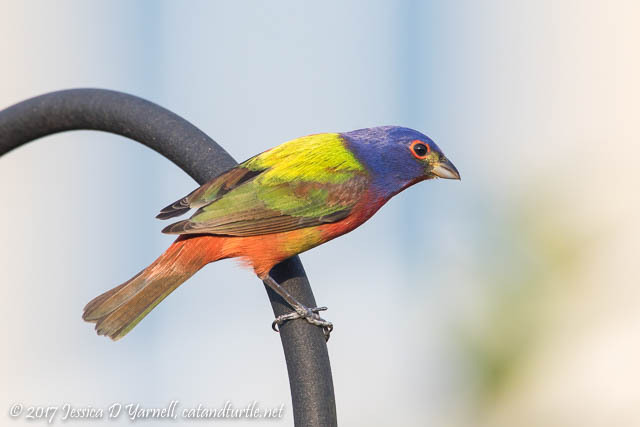 You haven’t seen enough Painted Buntings yet, have you? 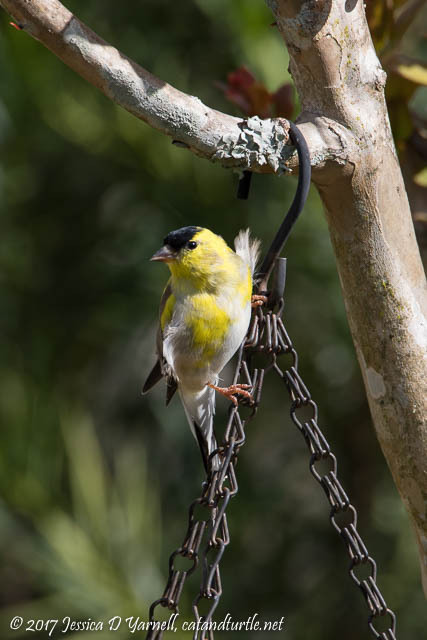 Who can resist seeing a male and a greenie together at the feeder? As a side note, if you are interested in attracting Painted Buntings to your yard, do plant some red-flowering plants. The males seem to enjoy the safety of their camouflage! 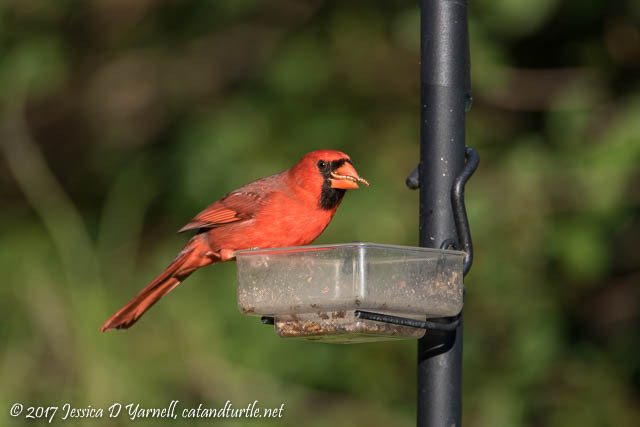 This male took refuge at the top of the feeder when a bunch of red-wings invaded. 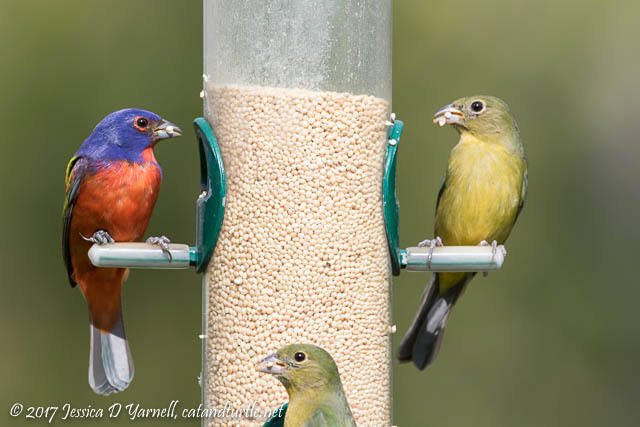 As I type this the Painted Buntings are starting to leave my yard, and I already miss them! They will return in October. 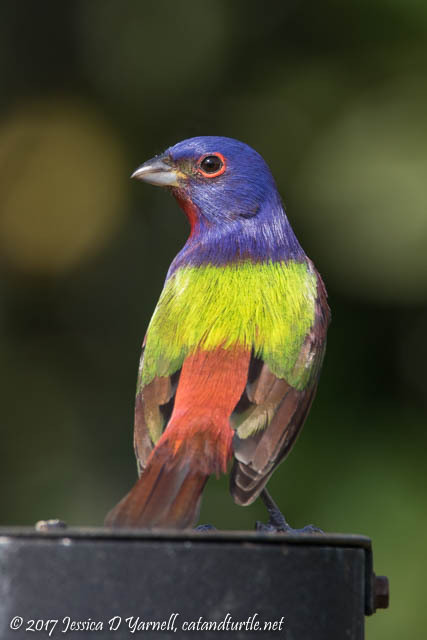 I wish the Painted Bunting banders lived closer. It’d be such fun to track the birds from year to year. But until they return…good luck, little birdies!